Bound. The buckler guardian is magically bound to a location. It cannot move further than 200 feet than that location, and becomes stunned if forced to do so. The buckler guardian can teleport to the centre of the location by concentrating for 1 minute. Regeneration. The buckler guardian regains 2 hit points at the start of each its turn if it has at least 1 hit point. Multiattack. The guardian makes two fist attacks. Fist. Melee Weapon Attack: +5 to hit, reach 5 ft., one target. Hit: 8 (1d10 + 3) bludgeoning damage. Shield. When a creature makes an attack against the owner or creator of the location, or an agent representing them, the guardian grants a +1 bonus to the wearer's AC if the guardian is within 5 feet of the wearer. 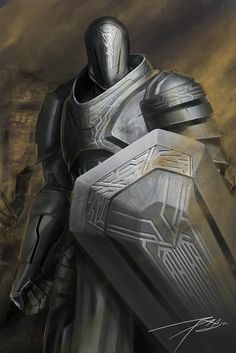 The buckler guardian is a lesser form of shield guardian often created by wizards to defend their towers. They are humanoid in shape, constructed from metal plates and brass gears, with a distinctive round shield on one arm. They do not need to sleep, drink or eat. A buckler guardian is magically linked to one locus, such as a vault or throne room. It cannot stray too far in pursuit of intruders, but can unerringly teleport back to its primary location. Buckler guardians automatically attack creatures that it does not recognize as the location's owner or people in their employ. If ownership of the location legally changes hands, the guardian is instantly aware of this. If the property has no legal ownership, such as an expired deed with no heir, the guardian stands dormant, only attacking to defend itself.